The red dot is a symbol of outraging design since more than 50 years. Since already since 1954 the design center North Rhine Westphalia marks exceptional products with its famous dot. Since 2000 the design competition wears the denomination red dot award: product design, since the award became internationally meaningful, and a global name had to come. Also this year about 1,800 companies and designers out of 58 countries presented their work at the red dot award for product design. A total of 4,515 products were presented this time, and the 30-people jury decided according to innovation, functionality, self-explaining qualities or ecologic adaptation. 1,058 times the red dot was given for exceptional design, but only 62 times the special denomination red dot : best of the best. The following selection of this years’ winners concentrated on the for consumers’ interesting categories living, kitchen, tableware and office. 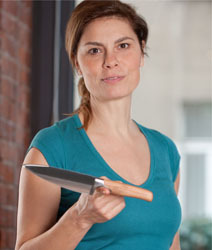 If a practice-professional such as the chef Sarah Wiener comes together with a tradition manufacturer as the cutlery manufacturer Pott, the result can only become successful ! It was thought about everything at the Sarah Wiener knives series: The 90 working-steps hand-made molybdenum-vanadium steel knives are exceptionally hard and stainless as well as pleasant in the hands because of a nine-steps smithy-procedure. Their handle is made out of plum wood and pleasant to hold as well as gaps-less, so that there won’t be resting foodstuff sticking at the knives. Another awarded in the category kitchen is the stackable storage box, ahich has been included by Stelton in a new, very sustainable sub-selection Rig-Tig. Stacked on a bamboo tray, they can also store pasta, muesli and sugar inside of cupboards, or also filled with food inside of the fridge, space savingly. The lid of the boxes is made out of the wood-synthetics-mixture WPC – this looks greate and saves the environment. For a similar space saving principle, the Nest Utensils by Joseph Joseph have also been honored with a red dot. The set includes a spatula, a spaghetti ladle, a sieve spoon, a serving spoon and a soup ladle that all are stacked inside each other. All this kept together by magnets. The jury of the red dpt award wasn’t only delighted by functional design, but also by appealing design. 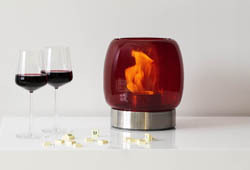 The bio ethanol powered fireplace Kaasa by the Finnish manufacturer Iittala can be used inside as well as outside of the house. It was inspired by historic sea-sign,s that stood along Finnish coasts as if they were campfires. With Kasaaone can create his own orientation point at home. The plate My Brunch by Eva Solo solutes a problem that might be known by everyone: Imagine yourself in front of a brunch buffet and filling your plate with a lot of tasty food, so that there is no more space for more food. The My Brunch plate goes over more than the plate’s borders, so that ham, fruits, salads or also other cutlery might be placed on the classic round table. The chairs series Pro, which has been designed by Konstantin Grcic for Flötotto, actualizes a classic of German everyday culture and really deserved an award therefore. The more than 21 million times sold ‘Flörotto-Form Seat’ with ergonomic formed seat should still be known from school-times by most of the people. Inspired by this chair, Grcic created a modern chairs collection, which isn’t only suitable for schools, but also for object and home areas. Still based on an ergonomig seating position. All these products, such as other awarded ones are exposed in the special exposition in the red dot design museum in Essen from the 3rd to the 29th July 2012. It will open after the official awarding on the 2nd July in the Essen Aalto theatre.